Posted on October 9th, by Graeme in iOS Music Apps. 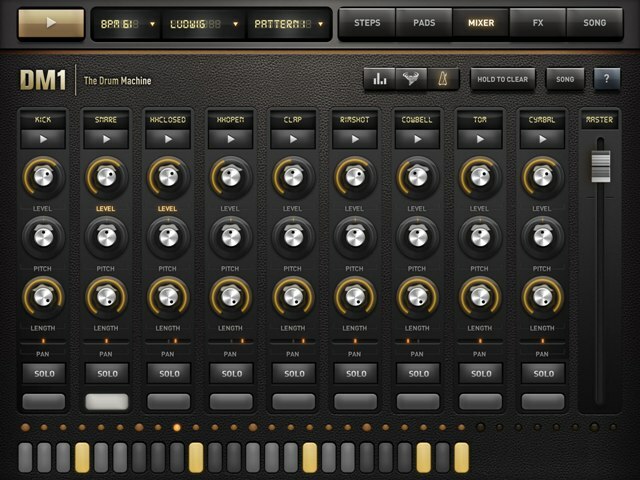 The DM1 Drum Machine from Fingerlab promises to be a “vintage” drum machine, but as often happens with software it really offers a mix of classic sounds and operations along with a dash of 21st century app technology – developers just can’t stop themselves adding improvements no matter how much you want to embrace the whole vintage thing. That’s okay, we’ll take the extras anytime. The workflow is old school. 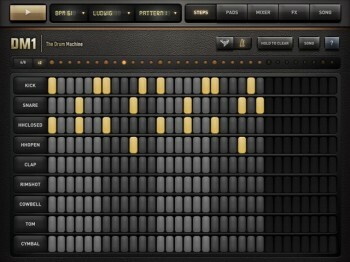 You create drum patterns either by recording beats in real time using nine pads or you can build them in a step sequencer page. Once you’ve completed any (or all) the patterns needed for a song, you place each one onto a Song timeline. The end result can be played back to your heart’s content, exported as a file to a variety of locations such as Soundcloud, iTunes, etc or recorded in real time into another recording app since DM1 is Audiobus compatible. 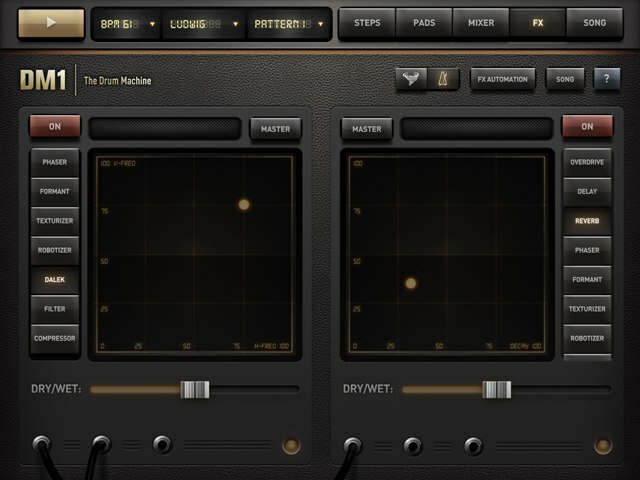 Where DM1 becomes a little more high-tech is a Mixer page where you can adjust the Level, Pitch, Length and Pan of the samples loaded onto each pad. 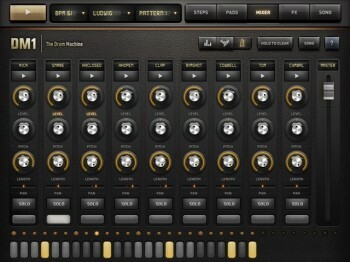 These features aren’t so much a modern improvement on the old drum machines – more that the app mixer GUI simplifies what might have been a torturous, menu-driven task on a hardware device. The mixer also has an Automation feature which isn’t quite what you’d expect given what we usually consider “automation” – more on that later. 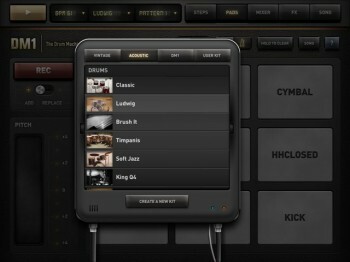 You’re given a whopping 86 drum kits ranging across Vintage, Acoustic and DM1 types. Vintage refers to genuinely vintage drum machine sounds like the TR-808, Linn 9000 and (my old nemesis) RX models to name just a few. The Acoustic bank includes, as the name suggests, kits based on acoustic drums like Classic, Ludwig and Studio, but it also gets into percussion collections and even instruments such as Piano, Flute and Cello. The DM1 tab goes further with sound effects kits that, for some, are a far cry from drum sounds altogether, but still useful and maybe even inspiring. The bottom line here is you’re not really getting 86 drum kits at all. A majority of the kits are made up from sound samples that aren’t drums. However, you’re still getting a heap of proper percussion collections. You can build your own kits from scratch, something many people chasing traditional drum sounds will prefer since most of the Acoustic kits always seem to lack something, but it can be quickly fixed by making your own. It takes a moment to get your head around that your drum selection is based on the DM1 kits. So for example, choosing a snare you might select the Ludwig Kit option in the snare drop-down menu – meaning you get the snare that’s a part of the DM1’s Ludwig kit. Huh? For each pad you choose the corresponding kit, not the snare itself, if that makes sense. Still no? Fair enough, it’s a bit puzzling, but you’ll get it. Loading a kit is easy, but straight away things can get a little confusing again. Because the labels on the nine pads never change regardless of the underlying sample loaded by the chosen kit. Admittedly, this is exactly the case on hardware drum machines, but Fingerlab is happy to improve on those originals in some aspects, so surely it can’t be too hard to have the pads re-label themselves? I found this disappointing, particularly when some straightforward kits loaded differently, such as putting a ride cymbal on the cowbell pad, a tom on the clap pad… things like that. The pads aren’t in any way velocity-sensitive. Once again, this is in keeping with most vintage hardware. The work-around is that mixer automation I mentioned earlier. By automating the Level (volume) of a pad, say the snare, after you’ve programmed the pattern you can create the kind of dynamics that might be achieved by real-time playing with touch sensitive pads. But this doesn’t mean that your mixer settings are flying all over the place in response to complicated automation – it’s like an extra layer of volume control designed to provide those dynamics. It works well, except for confusing some of us by calling it automation (take a deep breath, let it go…). The sample sounds are good, and the vintage samples are very close to the real thing. 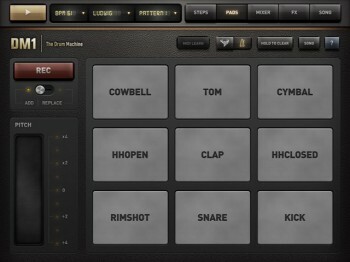 You don’t get many truly acoustic sounds, which I guess is to be expected on a drum machine app. Working your way through those Acoustic kits is the answer. 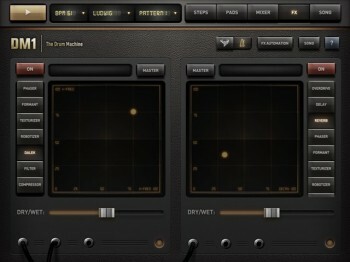 Two effects sends can be applied either to individual pads or the master output. Parameters for each effect are set using X/Y grids and can be automated (in the normal sense), if you like. The effects are cool and you can do some trippy things or just saturate a snare or kick with a nice reverb. Despite the criticisms above, I was impressed with the DM1. It really does give you a mix of retro, dare I say disco drum machine programming, or you can be a little more painstaking and create dynamic patterns that will give you a rock and roll feel, country feel… anything you want, depending on how patient you are. Plenty of alternative time signatures are allowed such as 6/8 and 7/4, and as mentioned before you can route the DM1 via Audiobus directly to a recording app or export a finished song as a file. 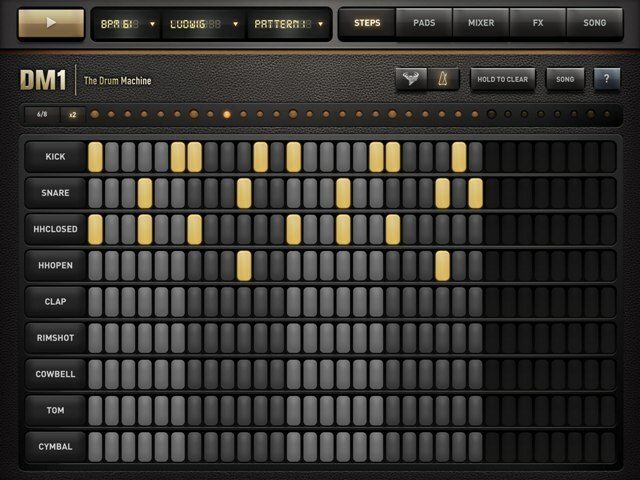 So for mine, as a mobile song writing tool, DM1 has everything you need for creating complex drum grooves and sounds good, too. Definitely value for money.